We caught a 5 a.m. flight on Monday, June 1 to Izmir, a large city on the west coast of Turkey. We were met by our guide Yileza, a young woman who was born in the villages of the Izmir province. She stayed with us for the two day visit to this area. After loading our “pack light” luggage into the back of a VW van, we made the 1 hour drive to the ancient city of Ephesus, stopping in the town of Seljuck for water and an ATM raid. The current historic ruins of Ephesus are from the 6th generation of that civilization dating back to early Roman times. Natural disasters, including earthquakes, and the silting of the original harbor, caused the location of the city of Ephesus to change over the years. What was once a heavily traveled harbor in the times of Justinian has now become a fertile landscape of olive trees, grapes, and other crops. A lot has changed since my first visit in 1981. The walk from the top of the hill down, through the ancient ruins of the servants homes and marketplace, to the base of the hill where the magnificent façade of the Celcius Library stands towering in front of us, to the astounding amphitheater with a capacity of over 20,000 people, took about 2 ½ hours. This is an ongoing, albeit sporadic, archeological restoration. Halfway through our walk downhill, we stopped to visit the newly excavated Terrace Houses, which are still under renovation. Climbing high up the hillside on level after level of metal stairs under which ancient mosaics were covered with glass platforms, we saw the most astounding archaeological restoration I have ever witnessed. The houses are located on the hillside directly adjacent to the well-photographed walkway leading to the Library. One section was hidden by grass, wildflowers and dirt, with a few sections of ancient masonry popping through, suggesting that those elements were covering a treasure trove of history. The Terrace Houses are part of an excavation of 6 terrace homes found in the 20th century, whose frescoes and mosaic floors were well preserved by the elements. Artisans were working on the tiny pieces of mosaic and frescoes tediously recreating and restoring them to their original state. See Brian’s pictures of the Terrace Houses. From the Houses, we walked down to the Library and then turned on the road leading to the other side of the hill, where we stood in awe of the magnificent amphitheater. The amphitheater faces what used to be the harbor – one could imagine ships of Romans heading toward Ephesus where the amphitheater was waiting on the hillside. From Ephesus, we had lunch in a traditional outdoor restaurant, where we watched the ladies making flat pastries that were eventually filled with cheese, meat, and vegetables, and then baked. Following lunch of Manti, vegetarian pastries, kebab, and Beer (DON’T DRINK BEER IF YOU DON’T KNOW WHAT THE BATHROOMS ARE LIKE!!) we headed up the road and up the mountainside to what is believed to be the last home of the Virgin Mary. Historians vary on their interpretation of the House of the Virgin Mary. Generally, most believe that St. John the Apostle brought Mary Mother of Christ to this area after Christ was crucified. She lived here in a small stone house for 4-6 years, where she died. No one knows for sure where she is buried, but adjacent to the historical site of Ephesus are the ruins of a church – the Basilica of St. Mary. Tradition at that time was that Basilicas were only named for those who had died in the region. Natural spring water flows just below the small stone house, and Christians make pilgrimages to this area for the water and to pray for love, wealth, and health. We next visited the remains of the Basilica of St. John the Apostle. Standing in ruins, one could only imagine what this massive religious edifice must have once looked like. Very nearby were the ruins of the Temple of Aphrodite. As is the apparent custom in this area, when the temple was destroyed in a devastating earthquake, the locals used the columns and marble to construct the Basilica, where historians believed St. John was originally buried. Sitting on a hill over the town of Selcuk, the Basilica would have been seen for miles. Now, it stands in ruins, and its marble and stone has been used to build a mosque sitting just below the hill where the Basilica once towered. By now, this near-geriatric group of tourists was hobbling with aching knees, feet, backs and sore bodies to the point of exhaustion. Thank goodness for Lisa, healthy, youthful and always cheerful, setting an example for us each time we were faced with yet another hill to climb, or another steep set of stairs! We checked into our hotel in Kusadasi, the famous resort town where cruise ships stop for the visit to Ephesus. We had time to do laundry (can you imagine seeing underwear, shirts, pants, and PJs hanging from the balcony furniture of a 5 star hotel), nap and then have dinner. Day 2: No Free Lunch! The next day, we drove with our guide and driver to the small village of Sirence. This village was historically occupied by Greeks, who lived in the hillside homes and farmed the land with fruit trees, olives and grapes. Their produce was turned into fruit wines and olive oil. The woman “allegedly” embroidered linen and cotton table clothes and decorative pieces. Our guide explained its history this way: After WWI, and the fall of the Ottoman empire, the Greeks of Sirence “exchanged” their homes in this village with the Turks who occupied Greece. Today, no Greeks live here (an area they occupied for hundreds of years) and the homes and vineyards are now owned by Turkish farmers. A small non-working Greek Church sits at the top of the hill, the pathway to which is lined by little stalls holding the handiwork of the local women. We were invited into the home of one of these women, an 85 year old mother of 3. Now, if this lady could climb up and down those steep stone pathways as limber as she was, none of us had any right to complain! After sharing tea with her, we followed her down to the stalls of linen handiwork, where the Amirian sisters began their haggling for the daily “bargain” of “hand-made tablecloths”. Handmade by whom is the question of the day. We next worked our way down the hill to a wine tasting store. There we tasted black mulberry, tangerine, blackberry, apple and strawberry wine. The black mulberry reminded us of the mulberry trees in the backyard of my grandmother’s home more than 50 years ago – where we would go as a family outing yearly and pick berries. From those berries, we enjoyed mulberry jam, syrup, wine, and pie through the year. Last but not least, we travelled back to the city of Selcuk, where our guide told us we would stop at a carpet showroom for lunch. “No obligations – they will serve you lunch for no charge, just leave a small tip.” Lesson learned – no free lunches exist in Selcuk! 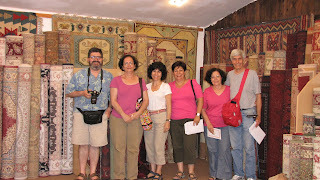 After having a nice kebab lunch, we were escorted through the process of carpet making, including how silk yarn is made. 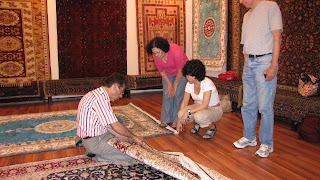 We then went into the showroom, where we were served tea and wine, and looked at nearly 100 various carpets. By six p.m., every one of us had purchased a new carpet --- as we walked out of the showroom, we heard the salesman share his thanks for helping him reach a significant financial goal – i.e. NO FREE LUNCH!! Returning to our hotel, we ate dinner - a very boring buffet designed to feed a mass of tourists coming from the 4-5 large tour buses that pulled into the hotel n the early evening. Following dinner, we caught a catnap before our 5 a.m. flight to Kayseri via Istanbul. We left our hotel at 2:45 a.m., and arrived in Kayseri at 8:50, 6 very tired travelers.